The Bluetooth hands-free speakerphone device is built-in powerful magnet, which is dedicated and convenient for wireless communications. Sunshade hanging structure does not take space, and call quality is very excellent. With an advanced built-in microphone, a DSP solution with echo cancellation and noise suppression , the speaker creates an excellent sound quality for you. 1.Make sure that your speakerphone is fully charged for two hours before you start using it. When charging, the light will turn red. 2.Long press the switch button, open Bluetooth hands-free. 3.Open your phone Bluetooth, and search as well as match. 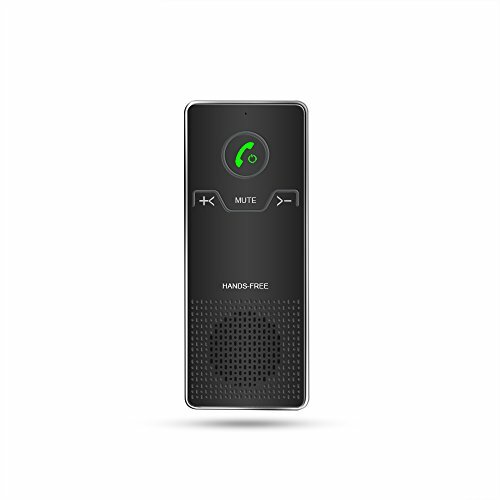 Bluetooth 4.0+EDR & Hands Free: support Bluetooth V4.0+EDR/HFP/HSP/A2DP/AVRCP, up to 33ft connection range guarantees low signal delay, this car speakerphone makes you enjoy music and hands-free calls from your smart phone. Multipoint & Automatically Connecting: the bluetooth speakerphone is able to pair 2 phones at the same time. Pairing is needed the first time, the speakerphone will connect your phone next time, it can remember 8 phones. Battery & Dormant Function: 17 hours talk time and 30 days standby time. while 10mins after disconnect, the speakerphone enter dormant mode so that save power. DSP Technology: with digital sound enhancement, noise cancellation, echo cancellation, the speakerphone creates an excellent sound quality for you. User-friendly Design: Bluetooth visor speakerphone can sit on sun visor with magnet clip, also can be placed on car air conditioner outlet.